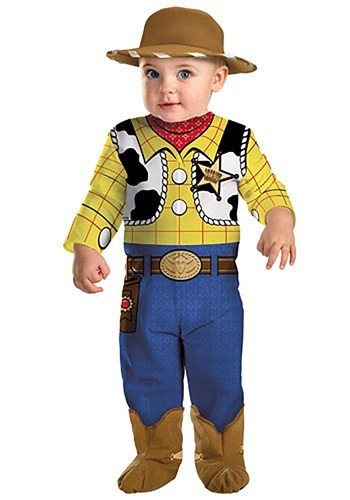 Dress your little partner up like Woody from Toy Story in this soft infant costume! Your little guy will be ready for Halloween in this costume. Make sure to get him a friend to wear our infant Buzz Lightyear costume, or you can dress up as Buzz yourself. Better yet, your entire family can dress up as characters from Woody’s gang of toys and round up pals! Your child will be the favorite deputy when he his wearing this Woody Toy Story Infant Costume. The costume is made up of a 100% polyester brushed knit flannel and interlock knit fabrics. The flannel shirt portion of suit and interlock pants have front snaps, while the shirt is printed to look like a yellow plaid shirt with a red scarf and cowhide vest. The attached pants are printed to look like blue denim with a belt and holster. The adorable flannel booties have printed spur and cacti designs. The polyfoam cowboy hat has ribbon overcast stitching on brim and completes the overall costume. This is a cute costume and fast shipping.